Throughout her time with the KSMP, Dr. Cindy Karsten has helped to identify and implement best practice protocols and capacity for care models at shelters across the United States and Canada. 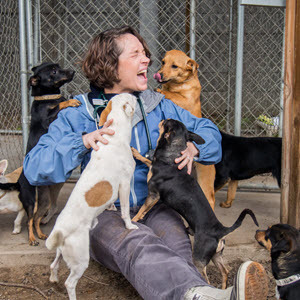 She has participated in numerous shelter consultations at both rural and urban animal care facilities, where she has assertively identified far-reaching solutions in the face of limited shelter resources. Dr. Karsten became board certified in Shelter Medicine Practice in November, 2017. Her main areas of interest include population management, infectious disease control, intake diversion/safety net programs, and providing affordable, accessible veterinary care in all communities. Dr. Karsten serves as a board member of and volunteers with the non-profits Mercer Veterinary Clinic for Pets of the Homeless, and Compassion Without Borders. She leads and conducts wellness/spay-neuter clinics with veterinary students regularly in Covelo, CA (an underserved community without a veterinarian), and volunteers at numerous community clinics around California. She also continues to fund-raise for and coordinate the transport of small dogs from facilities in central California to shelters in the Midwest and Canada with a grand total of over 2,000 so far! Karsten, C.L., Wagner, D.C., Kass, P.H., Hurley, K.F. (2017). “An observational study of the relationship between Capacity for Care as an animal shelter management model and cat health, adoption and death in three animal shelters.” The Veterinary Journal 227: 15-22. CL Karsten (2017). Sanitation and Disinfection. Infectious Disease Management in Animal Shelters. Second edition. L. Miller, K. Hurley and S. Janeczko.